Coppell, TX – February 12, 2019 – Uniview Technology (uniview tec), the New Alternative for smart,innovative and feature rich network video security solutions, announces the release of a new integrated VMS server allowing unified managementof all network devices in a large, enterprise level, video surveillance application. The NR25616 surveillance platform expands the growing line of enterprise level network video recorders to a whole new level, continuing the tradition of adding value and intelligence to the uniview tec portfolio. 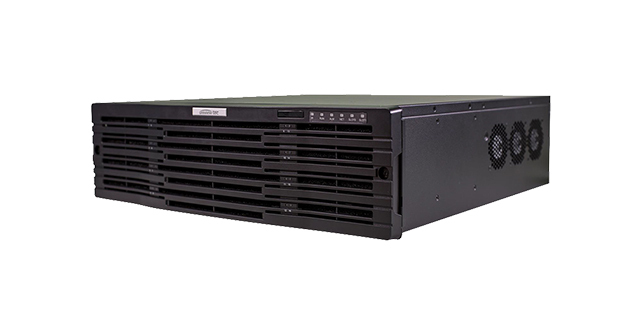 The NR25616 server provides smart, integrated management of IP cameras, network recorders, decoders, disk enclosures and more, up to 1000 devices. In addition, the server can record up to 256, 12MP (4000 x 3000) resolution, video inputs and display them on 3 HDMI and VGA monitors, or up to 15 monitors in a Video Wall application. Featuring Ultra 265, an in-house developed deep H.265 compression technology that can reduce bandwidth requirements by up to 75%, the NR25616 is powered by an Intel® CPU, embedded Linux OS with dual bios, redundant network ports and internal fans, and an optional redundant power supply, all for a stable and reliable operation in the most demanding applications. The maximum internal storage is 160TB, with 16 SATA HDD bays at 10TB each, including Hot Swap capability and RAID storage technology. In addition, the NR25616 supports optional external storage devices allowing up to an additional 320TB of storage capacity. Third-party cameras are supported through ONVIF Profile Series compliance, while cloud upgrades are available exclusively for connected uniview tec cameras with automatic detection of the latest firmware. Furthermore, the NR25616 is supported by license-free uniview tec Guard Station Client Software for Windows and Mac PC’s, and Guard Viewer Mobile App’s for iPhone and Android Devices, allowing easy access to video from anywhere in the world. So check out the growing line of intelligent and feature rich products Uniview Technology has to offer your business, church, school or home. uniview tec — the New Alternative for affordable network video security product and service solutions. Uniview Technology offers smart, affordable and high quality IP video security solutions that enable a secure and safer world. As a market leader in network video, Uniview Technology continues to drive the industry by launching new and innovative network products, delivering feature rich products the industry demands at an affordable price.